The Pepperdine University Graduate School of Business and Management spring 2017 commencement ceremony will take place at Firestone Fieldhouse on the Malibu campus on Saturday, April 22, at 10:30 AM. The event will bestow an honorary Doctor of Business degree upon Thomas J. Donohue and honor James S. Metcalf (MBA ’83) as this year’s Distinguished Alumnus. 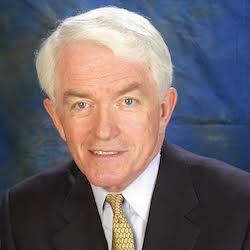 Donohue is president and chief executive officer of the US Chamber of Commerce. Since assuming this position in 1997, Donohue has built the organization into a lobbying and political powerhouse with expanded influence across the globe. In an era of economic and fiscal challenges, Donohue has aggressively advanced the American Jobs, Growth, and Opportunity Agenda—a plan that includes expanding trade and domestic energy production, rebuilding America’s infrastructure, combating an avalanche of new regulations, protecting intellectual property, revitalizing capital markets, and reforming entitlements and the tax system. Donohue established the US Chamber Institute for Legal Reform, which advances significant legal reforms in the courts, at the state and federal levels, and in elections for state attorneys general and Supreme Court judges. He has dramatically expanded the activities of the US Chamber Litigation Center, the chamber’s law firm, and has reinvigorated the US Chamber of Commerce Foundation, which houses Hiring Our Heroes, a program that identifies job opportunities for tens of thousands of returning veterans and military spouses. 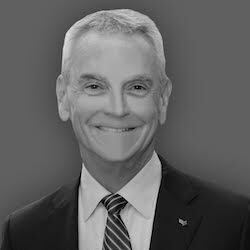 Previously Donohue served for 13 years as president and chief executive officer of the American Trucking Associations, the national organization of the trucking industry. Earlier in his career, Donohue was deputy assistant postmaster general of the United States and vice president of development at Fairfield University in Connecticut. Donohue earned a bachelor’s degree from St. John’s University and a master’s degree in business administration from Adelphi University. He holds honorary degrees from St. John’s, Adelphi, Marymount, and Bradley universities, as well as the National University of Ireland at Maynooth. He is a 2013 recipient of the Horatio Alger Award. Metcalf is former chair, president, and CEO of USG Corporation. Headquartered in Chicago, Illinois, USG Corporation is a manufacturer and distributor of innovative, high-performance building systems, with annual revenues of about $3.8 billion. Metcalf began at USG as a trainee out of college, progressing through nearly every sales, marketing, and strategic planning role at the company before serving as president from 2006 to 2016. Assuming leadership toward the start of the Great Recession, Metcalf steered USG out the downturn into profitability by drastically lowering costs and promoting innovation—developing new products, opening new global markets, and forming profitable joint ventures. During his tenure USG was the recipient of the prestigious 2016 Robert W. Campbell Award from the National Safety Council for outstanding environmental, health, and safety programs. USG also became the only building products company to have ever won the Home Depot Innovator of the Year award. Metcalf serves on Tenneco, Inc.’s board of directors and serves on the audit committee. He is also is a corporate director with the National Association of Manufacturers, serving as a member of its executive committee and as vice chair of the Midwest. From 2007 to 2013 he served as a director for Molex, Inc. Among his community involvements, Metcalf serves on advisory boards of the Joint Center for Housing Studies at Harvard University, the Buckeye Leadership Fellows Program at The Ohio State University, and the Robert Crown Center. He is also a member of CEOs Against Cancer, a trustee of the Rush University Medical Center, and a Malcolm Baldridge Fellow. Metcalf received his bachelor’s degree from The Ohio State University and his MBA from the Graziadio School in 1983. He is also an alumnus of the Stanford University Graduate School of Business Executive Program. For additional information, visit the Graziadio School Graduation website.